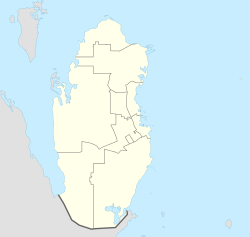 Madinat ash Shamal (Arabic: الشمال‎) is the capital city of the municipality of Al Shamal in Qatar. It was delimited in 1988 and shares its boundaries with Ar Ru'ays to the east and Abu Dhalouf to the west. The city's name "Madinat ash Shamal" translates to "city of the north". Madinat ash Shamal is located at a distance of over 100 km of the capital Doha, 27 km away from Zubarah, 24 km away from Fuwayrit, 76 km away from Al Khor, and 122 km away from Al Wakrah. Throughout most of the 20th century, Abu Dhalouf and Ar Ru'ays were the largest villages on the northern coast. In the early 1970s, the Qatari government enacted a plan to establish Madinat ash Shamal between these two villages to serve as an administrative center for the north, in line with its policy of decentralization. Throughout the 1970s, a road system and a port were built to connect the three villages. As part of a government housing project, 50 houses had been built in Madinat ash Shamal by 1976. Large-scale development of Madinat ash Shamal continued through the 1980s and 1990s. Acalypha wilkesiana in Madinat ash Shamal Park. Situated next to the Al Shamal Municipality headquarters is Madinat ash Shamal Park. One of Qatar's larger parks, it occupies an area of 56,000 square meters. Facilities in the park include a restaurant, cafe, bathrooms and a children's play area. Water features are present in the park, as well as an irrigation system to sustain its various plants. The city's first public library was opened in 1979. By 1976 the city had its first hospital, with a meager 16 beds. At present, one of the only healthcare centers in the region is hosted by the city. Multi-sports club Al Shamal SC is based in the city. They play their home games at Al-Shamal SC Stadium, which is fashioned after a traditional fort. When free elections of the Central Municipal Council first took place in Qatar during 1999, Madinat ash Shamal was designated the seat of constituency no. 28. It would remain the headquarters of constituency no. 28 for the next three consecutive elections until the fifth municipal elections in 2015, when it was moved to constituency no. 29 and the seat was shared by Madinat ash Shamal and Ar Ru'ays. Also included in its constituency is Abu Dhalouf, Al Jumail, Zubarah, Ain Mohammed and Al `Arish. In the inaugural municipal elections in 1999, Saad Ali Al Nuaimi won the elections, receiving 33.3%, or 64 votes. The runner-up candidate was Hussain Ibrahim Al Fadhalah, whose share of the votes was 18.2%, or 35 votes. Voter turnout was 87.7% Al Nuaimi retained his seat in the 2002, 2007 and 2011 elections. In the 2015 elections, Nasser Hassan Al-Kubaisi was elected constituency representative. ^ "2010 population census" (PDF). Qatar Statistics Authority. Archived from the original (PDF) on 2 April 2015. Retrieved 2 July 2015. ^ "Law No. 25 of 1988 On the Delimitation of the City of Al Shamal". almeezan.qa. Retrieved 29 July 2015. ^ "About Qatar". Civil Aviation Authority. Retrieved 9 August 2017. ^ Whelan, John (1983). Qatar, a MEED practical guide. London: Middle East Economic Digest. p. 160. ISBN 0950521191. ^ a b "Al Shamal Municipality: Vision and Development Strategy" (PDF). Ministry of Municipality and Environment. December 2017. p. 4. Retrieved 22 May 2018. ^ Qatar Year Book: 1976. Doha: Press and Publications Department, Ministry of Information. 1976. p. 64. ^ "منتزة مدينة الشمال" (in Arabic). Ministry of Municipality and Environment. Retrieved 22 June 2018. ^ Abdullahi, Ismaïl (2009). Global Library and Information Science - a Textbook for Students and Educators. IFLA Publications; 136/137. München: K.G. Saur. p. 424. ISBN 978-3-598-22042-5. ^ Qatar Year Book: 1976. Doha: Press and Publications Department, Ministry of Information. 1976. p. 62. ^ "Al Shamal Municipality: Vision and Development Strategy" (PDF). Ministry of Municipality and Environment. December 2017. p. 20. Retrieved 26 August 2018. ^ "Al Shamal Club". Qatar Football Association. Retrieved 27 June 2018. ^ "Central Municipal Council". Government Communications Office of Qatar. Retrieved 14 August 2018. ^ a b "إنتخابات الدورة الأولى" (in Arabic). Central Municipal Council. Retrieved 14 August 2018. ^ a b "مقـار الدوائـر" (in Arabic). Ministry of Interior (Qatar). Retrieved 14 August 2018. ^ "الدورة الثانية" (in Arabic). Central Municipal Council. Retrieved 14 August 2018. ^ "إنتخابات الدورة الثالثة" (in Arabic). Central Municipal Council. Retrieved 14 August 2018. ^ "رابعاً: إنتخابات الدورة الرابعة كشف بأسماء السادة المرشحين الفائزين في عضوية انتخابات المجلس البلدي المركزي (الدورة الرابعة - 2011م)" (in Arabic). Central Municipal Council. Retrieved 14 August 2018. This page was last edited on 25 March 2019, at 11:46 (UTC).